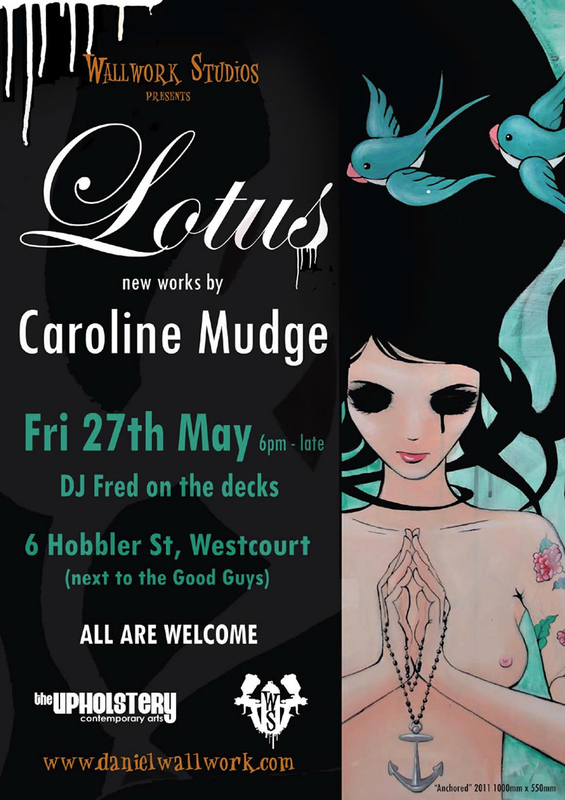 Wallwork Studios is proud to announce the second show in its dynamic 2011 program,… Lotus, the highly anticipated, first solo exhibition from Cairns artist Caroline Mudge. Join us at Wallwork Studios this Friday night, 27th May 2011, as one of the Far Norths’ favourite artists, Caroline Mudge, will be in full-colour bloom, when she opens the celestial petals of her stunning new exhibition, Lotus. Lotus is an exploration of how fast the mind gallops ahead to the future or past rarely being still and concentrating on the present. Lotus flowers and leaves appear as tattoos on her eastern inspired women as they contemplate whether or not to fight, fly or accept the uncomfortable emotions they experience. In some Asian cultures, the lotus often represents purity of the body, speech, and mind as if floating above the waters of attachment and desire. “The themes in my work usually have a strong emotional thread exploring the light and dark side of life often with a humorous bend or a narrative quality. A North Queensland favourite, Caroline has been exhibited extensively in group shows both locally and nationally since 2006 and was featured in Yen magazines, all female, ‘Curvy’ exhibition. This included being asked by Adidas to be one of 15 artists selected to customise a limited edition jacket. Although She has exhibited widely, this is actually Carolines’, first ever solo exhibition. The exhibition will feature a series of stunning new works and a selection of rarely seen recent works, including paintings on canvas, ply, found panels of wood and watercolour. Don’t miss the chance to see one of the hottest shows of 2011 and get your hands on these stunning works from one of the North’s, most exciting artists.